Several thousand people demonstrated in front of Spain's Superior Court of Justice in Catalonia this morning, while current president Artur Mas arrived, flanked by 400 mayors from all over Catalonia, and gave testimony on charges that he misused his office in order to allow a 'participatory process' that allowed Catalans to overwhelming vote in favor of Catalan independence last November 9, 2014. About 2.3 million people (out of 5.5 million) voted, despite scorn and threats from the government, as well as its non-official nature. The testimony comes on the 75th anniversary, to the day, of the execution by firing squad of Catalonia's earlier president Lluís Companys, who was dragged back from France by the Gestapo and then summarily tried and executed by Francisco Franco's troops. These had the gall to try the president for rebellion, despite that it was Franco and his followers who took up arms against their own government, and that Companys was a democratically elected president, indeed the only incumbent president in Europe to ever be executed. France and Germany apologized for their part in capturing Companys; Spain has repeatedly refused to annul the sentence or apologize for its actions. Whether calling the current president to testify on this date was intentional or not, we do not know, but they evidently saw no need to change the date, once they learned of its significance. President Mas made a statement at the Catalan Government building a little while later in which he took full responsibility for the vote, but refused to accept that any criminal charges should be brought in consequence. He explained that the Catalan government's actions on the vote could be divided into three periods: First, the government had passed legislation allowing for a non-binding referendum and that he had signed a decree to hold the vote on September 27, but that the Spanish Constitutional Court had suspended the legislation and the decree in record time on September 28 and 29. On October 14, the president announced that the government would carry out a 'participatory process' with the help of citizen volunteers, and the Spanish government limited itself to scornful comments about said process over the course of the next 15 days. The Catalan government did help organize during those 15 days, but there was no prohibition against it. When the Spanish government realized that the vote would be successful, the Constitutional Court disallowed the new format as well, but that didn't happen until four or five days before the vote. The President said that after that point, the Catalan government issued no additional orders nor instructions, thereby complying with the prohibition, and that it was volunteers who carried out all actions related to the vote. He also asked whether any Spanish government body had made any move to stop the participatory process and wondered why only the Catalan government was being held to account. He also noted that the Spanish government had disobeyed the Constitutional Court rulings on many occasions with no consequences. You can find my Storify of the President's remarks. Former Vice President Joana Ortega, and current Education Minister Irene Rigau gave testimony on Tuesday, another infamous day, the anniversary of the execution of Francesc Ferrer i Guàrdia, the promoter of the Modern School (Escola Modern) in Barcelona. It's enough to make you think Spain is itching for a confrontation. And to convince you that it doesn't know a lot about democracy. Junts pel Sí [Together for Yes] is not a political party, nor does it aspire to be one. 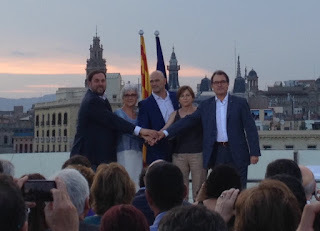 Junts pel Sí is a temporary fellowship of very diverse members, that goes way beyond the initials of CDC or ERC or other political formations. It's hard to imagine such an unorthodox coalition without taking into account the common objective that responds to the demands of a country and a people as heterogeneous as Catalonia. It is in no way a coalition designed to handily win some regional elections. And if anyone has come to that conclusion, either inside or out of the country, they are way, way off base. Let's make it clear, then: Junts pel Sí has no other raison d'être than to win independence. From here comes its strength and its uniqueness. What we are going to do, what we are firmly determined to do, is create a new country that is more free and more just, a country whose standard is the will to live and let live. And that is only possible through independence. And that is precisely the point that distances a good number of those of us who form this Yes list from other perfectly respectable political options like Catalunya Sí que es Pot. We may share a desire for social justice, for democratic regeneration. However, we are conscious that we can only win a country that is more fair and more free by first winning our independence and constructing—between all of us—the Catalan Republic: a fully democratic state which has the unique opportunity of creating a state that is truly at the service of the citizenry. Trying to make us believe that the solution will come from hypothetical new majorities in the Spanish government is pie in the sky. We all know those majorities are not there. Not only because they require the collusion of the PP and PSOE. But also because in the best of cases, the emerging political options in Spain are simply not interested. However, it's obvious that many of us are convinced that in the definition of this Catalan Republic it will be inevitable, and indeed desirable to count on all of these good people who long for a more just country in which equal opportunity is a foundational value. In this specific area we consider ourselves very close to these other political formations and candidacies. And the fact that a friend and companion like Raül Romeva (what an awesome candidate we have!) is at the top of the Together for Yes list is, in itself, a categorical declaration of principles. Independence is the essential leverage for change. Independence is the key to a new country, it is the only road to the Catalan Republic, it is the only opportunity to create an efficient country, that functions with rational criteria, that administers its resources for the good of the economic needs of the country and all of its people, that it builds itself a powerful network of infrastructures that connects us with the world and that at the same time responds to the daily needs of its citizens, starting with a decent regional rail network. Or that guarantees a pension model for our seniors. Or access to decent housing. Or that allows our young people, our future generations, to have true opportunities in the country of their birth instead of having to travel abroad to build their future. For that reason alone, independence is essential. It's true that there are also weighty cultural and historic reasons. But above all, beyond everything else, there is the need to construct a country that serves the needs of the people, that seeks a better future for them, for all, regardless of where they were born or the language that they speak. Those that advocate democratic regeneration or social justice will never be adversaries of independentism. On the contrary, they will always be potential allies. Independence is not an ideology, of course. It has never been one. Independence goes against no one, but rather in the end—and absolutely completely I would say—it is at the service of all of the citizens of the country, of all of them without exception. This is why, as I said at the beginning, there is a group of us that have joined together in Together for Yes that in other circumstances would probably never have come together in a single candidacy. From herein lies its strength, its power, its capacity to enthuse, its unequivocal service to a just cause. That is why independence must be, here and now, an unequivocal commitment to the citizenry. It's obvious that we have to talk with the Spanish government, to negotiate the birth of the Catalan State in the most amicable manner and to achieve the best neighborly relations. But we do not accumulate this joint strength in order to ask permission, nor to negotiate a new status quo with the State, but rather to reflect a demonstration of sovereign will of the Catalan people which will be exercised without delays in a dialogue among equals with the Spanish State. We are going to win independence, we are going all out, it's been said, and we are going all out not only because it's the only possible path or because they've left us no other alternative. We're doing so out of dignity, because we have every right, because of the wishes of all of those who came before us, and because we know that only the Catalan Republic, in the words of Francesc Macià, can ensure "a politically free, socially just, economically prosperous, and spiritually glorious Catalonia". The big question, which at the same time is an opportunity is, since we have to set aside the positioning of the political parties in the sense that I mentioned before, can we, through civil society forge this unity that Catalonia needs as well as its sovereignty which is so fundamental, yes or no? Can it be done or can't it? There is a role to play here. There is a key, decisive, central role. We have all these people who are organized, organized groups that have mobilized hundreds of thousands of people. Who have done their homework, that have helped bring the people out, who have behaved with a remarkable patriotic spirit. Who weren't in politics. 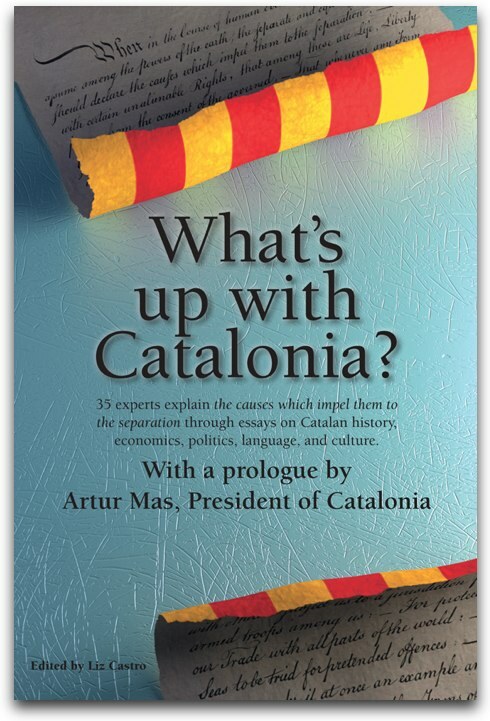 They were in civic groups and they believed that Catalonia can be that country that I described before. And they know that now we are at one of those decisive moments. And that we can't fail right now. I'm referring to the Catalan National Assembly, Omnium, and AMI, to a bunch of groups that are part of the "National Pact for the Right to Decide" all of those groups that represent the people of our country, all of these groups represent people in our country who have in this decisive, last phase, an important role to play from the point of view of the maximum unity possible in the sovereigntist world. I'm setting aside the parties so there are no misinterpretations. I'm speaking directly to these groups. Is it possible that they work in the next few days and weeks to achieve the most unity possible, and thus the most strength possible, and thus the largest possible guarantee so that we win on September 27? Is it able with its energy and drive, and its leadership and can we put this concept of the maximum unity possible on our agenda? Well, I'm inviting them to do so. I invite these sovereigntist groups at this decisive moment for Catalonia, where everything is on the line, for the victor of a Yes-yes, to work seriously in order to achieve the maximum unity possible. At this moment, it's urgent and essential, practically essential. This call is for the sovereigntist forces to join together. I'm not talking about the political forces but rather the sovereigntist ones. They talk about the "president's list"... I already said that this is a concept that makes me uncomfortable. It makes me uneasy. It's still just focusing too much on one person that I think is not helpful. So when I say these sovereigntist forces, when I say can you join forces? Can you in the sovereigntist field join forces? Can you guarantee the maximum possible unity? I also say, don't think about the 'president's list', think if it's necessary to have a "list with the president" which is not the same thing. It's not the same thing to have a "president's list" and a "list with the president". I make this plea at this decisive moment to group together forces in the sovereigntist world, beyond the parties. Let's leave the parties aside. If I make this call to the civic groups, in the sovereigntist world, I can't attempt to make this invitation and say "come to the president's list". However, I can make a call for them to keep me in mind to the degree that it's necessary and to play the role that's necessary. And I would dare to say something else. I believe that Convergència Democràtica de Catalunya can also be counted on to offer this huge service to the country at this moment. I believe that it can be counted on. That obviously can't be decided by myself alone, but I think it can be counted on. We have talked a lot lately about the role that CDC can play in the service of Catalonia at this moment. And beyond Convergència, we have seen these days that the people from the Catalanist Christian Democrats from the Yes-Yes can also be counted on to join an initiative like that. Of course they can. And we need them. Just like we need all those people from the Catalanist Socialist world who are also for Yes-Yes. And we also need them. Those folks who come from the world of the old PSUC or from communism. Or any of the currents that were profoundly Catalanist and who came to the conclusion that we either follow the sovereignty route or we won't make it. And if just one person does it, we won't make it either. But if that is understood by these highly mobilizing forces in society, taking into account of course that this is a responsibility that is not theirs to bear as civic groups, but that they can do it, and it's also a big service to the country if they see it that way. Why not? Said another way, we can make unity starting from the civil society. We can forge unity from civil society and we can add the parties, all of them, whichever ones who want to... no one is forced to join. Anyone can join, anyone can stay on the edges. I have spoken about myself, of CDC and I speak about the other groups that I believe they will want to join together to make unity possible from the civil society. Let's create the necessary unity. Let's face September 27 with more guarantees of success. We can't leave unity to just the other groups. He de dir que el format míting s'ha acabat ja sabeu que jo faig molts mítings quan vénen les eleccions. Ara també vénen, però encara estem una mica lluny. Ja hi tornarem al format míting. Avui la pretensió que teníem és intentar situar on som, què ha passat des del 9 de novembre. I sobretot, situar-nos de cara a aquests propers dies, aquestes properes setmanes, certament són decisives per al conjunt del nostre país. Voldria agrair-vos la vostra massiva presència. Demanem disculpes, moltes persones esteu dretes.. Això dóna molts ànims de coratge, molt reconfortant què hi ha tantes persones que realment estan amb les piles posades per encarar aquests moments decisius, aquestes hores decisives. Deixeu-me abordar les coses què volia compartir amb tots vosaltres, i a través dels mitjans de comunicació, amb el conjunt del nostre país. Fa sis mesos del nou de novembre. Sis mesos llargs, on han passat moltes coses. Ara faré referència a algunes. Molts mesos que han passat moltes coses i molts dels polítics. En destacaré quatre o cinc que són els més destacats. Ho enllaço amb el 9 de novembre i si ho permeteu també ho enllaço amb una conferència que portava escrita, que vaig fer al Fòrum de Barcelona el dia 25 de novembre de l'any passat. Per part meva, va ser una reflexió personal i també la manera d'adreçar-nos al país i a les formacions polítiques sobiranistes, per intentar compartir i traçar un full de ruta que ens portes a la victòria final. Ja dic d'entrada, que el que estem fent no ho estem fent per fer-ho. Ho estem fent per guanyar. Això ha de quedar molt clar. No es fa per fer és fa per guanyar. Per sortir victoriosos..
Quins han estat aquests fets polítics més rellevants d'aquests darrers sis mesos? · El primer van ser els acords del mes de gener d'aquest any. Uns acords forçats per les circumstàncies. Després d'aquell nou de novembre, d'aquella conferència meva del Fòrum, les coses es van embolicar. No tothom va compartir aquella estratègia. Alguns se'n van voler separar d'aquell moment. Va costar déu i ajuda recomposar les coses. Endreçar una altra vegada la situació. Van tenir una intervenció fonamental les entitats sobiranistes més destacades del país que han assumit el principal protagonisme d’acomboiar la gent del país a les grans mobilitzacions. Tot allò que ens va portar als cords del mes de gener. Que segurament no satisfeien, des del meu punt de vista, el full de ruta inicialment, traçat però que permetia mirar endavant i seguir el camí que havíem intentat començar. Avui no valoraré el compliment d'aquests acords. No ho valoraré perquè crec que avui no és el moment de fer-ho. Segurament el regust que deixa el compliment d'aquest acord pot ser desigual, per districtes, per barris, per formacions polítiques, per persones o per personatges. Però avui no és el tema de valorar si això ha sortit millor o pitjor. Ho tenim, està consignat i ara ens permet seguir avançant i ens ha permès seguir avançar en aquests mesos. · El segon fet ha estat el preacord sobre el full de ruta per després de les eleccions plebiscitàries. Recordeu que aquell full de ruta, aquest preacord també es va signar entre els mateixos que van signar els acords del mes de gener per tant, Esquerra Republicana, com va ja sabem, com l’ANC, l’AMI i Omnium. Full de ruta que està establert, que no està tancat del tot, perquè està a l'espera que altres s'hi puguin incorporar, i quan dic altres ho dic en sentit plural. Hi poden haver més d'un que es puguin incorporar. Hores d'ara no ho ha fet. Però teníem molt interès que quedés clar que no es tractava d'un acord definitivament tancat i que no hi havia res més. Sino les portes estaven obertes per intentar altres formacions polítiques que s'hi volguessin afegir. Altres entitats del marc sobiranista, del dret a decidir que es volguessin sumar. Rcordeu que en aquest preacord de full de ruta no es parla tant de com s'han de fer les eleccions, sinó que s'ha de fer després de les eleccions. Per tant, és el full de ruta compartit inicialment per abordar el canvi post eleccions 27 de setembre. · Tercer fet rellevant què ha passat. Hi ha hagut eleccions municipals a Catalunya i també a la resta de l'estat. I ha la resta de l'estat també hi ha hagut eleccions autonòmiques a moltes autonomies. Fixeu-vos que aquestes eleccions municipals han vist emergir algunes formacions, d'alguns moviments polítics que sobretot han sorgit “a la contra de”. Aquesta és una dada bastant rellevant. No ha sigut moviments polítics o socials que s'han plantejat d'entrada un objectiu a de la societat, sinó que han nascut, i en alguns casos exitoses, amb aquest ànim de anar a la contra d'una situació que consideren injusta i en part ho és. És evident que han sortit aquests moviments, en alguns llocs amb una especial incidència, i ha estat un fet rellevant d'aquests sis mesos. Fa sis mesos enrere no s'hi contava amb la dimensió amb què era aquest moviment en alguns indrets del nostre propi país..
· Què més ha passat? Ha passat té Unió Democràtica, què ha estat el nostre soci de Federació durant moltíssims anys, s'ha dividit internament, perquè ha posat a votació el full de ruta, i en definitiva el sí sí del 9 de novembre. Voleu un estat per Catalunya? Si, voleu que aquest estat sigui independent? Si. Aquesta és la nostra posició, és la que vam promoure. Unió això no ho havia resolt. Vull fer notar una cosa que és important que digui. O dues coses. La primera, per part de Convergència democràtica de Catalunya, no hi ha hagut cap ultimàtum a Unió. Se'n va parlar fa molts mesos enrere. Fins i tot molts mesos abans de les municipals, i poc després el nou de novembre. La direcció d’Unió va demanar en aquell moment no podia prendre una decisió ràpida i que és pogués ajornar aquella decisió. Ens va demanar que aquesta decisió fos després de les eleccions municipals. I Convergència, dintre del clima que sempre hi ha d’haver dintre d'una coalició o una Federació, va accedir que fos d'aquesta manera. Va demanar que després de les municipals aquest tema quedés resolt, perquè havíem d'encarar la recta de què havien de ser les eleccions plebiscitàries. Per tant, no hi ha hagut ultimàtum. Ara, certament després de les municipals és va demanar que la posició d'Unió fos explícita. Ells ja tenien previst fer la seva consulta interna. Sabeu quin va ser el resultat, sabeu quines són les conseqüències. La principal conseqüència és que després de 37 anys Convergència i Unió es separen. Això no vol dir que vol dir que sigui un divorci total, sinó que simplement tenen un tema de fons, que no comparteixen. Convergència està pel sí / sí, Unió una part significativa també ho ha estat, però una altra part no esta nomes pèl si/si. No és un tema de matís, és un tema de fons que està instal·lat en la nostra societat. I què és el que ha fet que milions de persones, centenars de persones, es mobilitzessin durant aquests darrers tres anys a la nostre país. I és aquell tema que si no es resol bé, quedarà pendent i quedarà pendent de manera negativa. Aquest país no pot tirar endavant si aquest tema no queda resolt com s’ha de resoldre: a les urnes. Nosaltres hem impulsat tot això perquè anés exactament d'aquesta manera. Per tant, hi ha un tema de fons que ens separa. No ens agrada que això hagi passat. Portaven molts anys de col·laboració. Sé que hi ha hagut molta gent d'aquest país que durant molts anys ha votat la fórmula de Convergència i Unió. Hem guanyat des de l'any 1980 totes les eleccions al Parlament de Catalunya amb aquesta fórmula i amb aquesta fórmula ha guanyat la majoria de les alcaldies del nostre país i dels consells comarcals,. Per tant jo no tinc satisfacció. Però és la realitat. I és la prova, després també ho comentaré, de que les coses van molt en sèrio. Aquí no estem per romanços. S'ha posat la directa i anem molt en sèrio. Les conseqüències, quan poses les coses en serio, són les que són. Però nosaltres les assumim. Aquest és el tema central que hi ha a la societat catalana, que no es un tema simplement per ell mateix, és el tema d’un estat per Catalunya, de la independència de Catalunya, és sobretot un instrument molt potent que serveix, no només d'uns ideals de llibertat, sinó també de tenir un país on tothom pugui viure millor. · Un últim fet rellevant és que, com era previsible, l'estat espanyol no ha variat ni un sol mil·límetre la seva posició. Això era així, i segueix sent així. Exactament així. Aquests darrers sis mesos no només no ha variat la seva posició, sinó que a més a més ha anat insistint en el retall permanent i sistemàtica de la nostra autonomia i del nostre autogovern. Fins al punt, amb el conseller Homs ho comentem, què hem arribat en aquella situació d'aquest ni tan sols ell diari oficial de la Generalitat de Catalunya té el valor que tenia abans, per què el volen substituir pel Boletin Oficial del Estado. Això va per aquí. Ja ho han decretat així. Jo us poso aquest exemple gairebé ridícul, però no deixa de ser molt simbòlic per fer entendre fins a quin punt la retallada de l'autonomia i l'autogovern és un fet que no es pot negar. Ningú pot negar aquesta evidència. Per tant, estem en aquest sentit de l'autogovern més enrere que estaven fa 4, 5, 6, 8 o 10 anys. Heu vist també que hi ha hagut aquesta nova sentència del Tribunal Constitucional , que com que no el poden esborrar el 9 de novembre, diuen que no el podíem fer. Però ja està fet.. Si el poguessin esborrar l’esborrarien . No s'aturarien davant d'això. Però com que no el poden esborrar han de dir que no el podíem fer. A partir d'aquí ja està fet... Aquests 2.340.000 persones que van anar a votar, hi van anar. La gran majoria el, 80% va votar sí sí. Això no s'esborra de la història democràtica i catalanista del nostre país. Això és el que ha passat ara en aquests darrers sis mesos. Quines conseqüències ha tingut tot això? 1- La primera conseqüència jo crec que no la podem amagar. A més a més, està a peu de carrer. La primera conseqüència és que allò que algunes vegades podíem haver dit del turbo de la il·lusió del procés sobiranista ha baixat una mica de revolucions. Dic que el turbo de la il·lusió, perquè en aquells moments de 9 de novembre i els dies posteriors, hi havia un autèntica prova d’il·lusió al nostre país des del punt de vista del projecte sobiranista. Les revolucions d'aquell turbo han baixat una mica. S'hagin apagat. El vehicle segueix funcionant, i segueix encarat cap a les metes què havia proposat. Però és evident que aquest tipus de processos cal afrontar-los amb el màxim de il·lusió possible. Amb il·lusió.. La il·lusió és el motor del canvi. És el que fa que el motor vagi a unes revolucions molt altes però que no posi en risc res. Per tant és cert ha baixat una mica el turbo de la il·lusió, d’aquestes revolucions que hi havia fa sis mesos. Ara bé, pareu atenció: els altres problemes, les necessitats, i reptes de Catalunya, aquests no han baixat. Aquests segueixen sent els mateixos. Per tant, la nostra responsabilitat en aquests moment, els que defensem aquest moviment i aquest procés sobiranista, els que defensem el sí sí, és tornar a posar el turbo de la il·lusió a dalt de tot. Si no el tornem a posar a dalt de tot, correm el risc de què un projecte que pot ser guanyador, no acabi sent-ho. Tot això no ho podrem atribuir a la responsabilitat dels altres. Serà la nostra. Ja sabem què d'obstacles en tenim molts. I d’adversaris moltíssims, i no pas poc poderosos. Però no serà culpa d'ells. Ells faran tot el possible perquè aquesta il·lusió es dilueixi. Ja ho estan fent. Però nosaltres tenim una responsabilitat interna. Aquesta responsabilitat interna passa perquè si els problemes i els reptes del país no han baixat, que no baixi tampoc aquestes revolucions de la il·lusió que ha de portar a la gran victòria. 2- Quina altra conseqüència hi ha hagut d'aquests fets aquests darrers sis mesos? Allò que us deia abans: l'aparició d'un eix nou a la política catalana que posa l'accent en la lluita de classes. Però que va acompanyat de la absoluta indefinició sobre el tema sobiranista. Això no ho oblideu. És cert, hi ha moviments en aquest moment, com aquest que us deia que volen posar l’accent en l’àmbit de la lluita de classes. Però no en el dret a decidir, ni molt menys la sobirania de Catalunya. Per tant, d'una forma o d'una altra, això pot canviar l’eix del que significa la política catalana en aquests propers temps. Això ho hem de tenir present la gent que volem defensar el sí sí. Fixeu-vos que en aquesta emergència d'aquest tipus de moviments polítics, gairebé poden ser iguals fora de Catalunya que a Catalunya. No hi ha molta diferència entre el que passa a la ciutat de Madrid i el que ha passat a la ciutat de Barcelona. Pot ser igual dintre de Catalunya que fora de Catalunya. Senyal que el tema del dret a decidir i la sobirania es deixen de banda en aquest tipus de moviments. També a Catalunya. Això ho hem de tenir ben present. Dit d'una altra manera, el “sí se puede” que vam escoltar fa uns dies a la plaça Sant Jaume, aquell “sí se puede”, té molt poc a veure amb l'autogovern de Catalunya, té molt poc a veure amb la sobirania, té molt poc a veure amb el referèndum sobre el futur polític del país. Té a veure amb altres coses. Que no les menystinc, gens ni mica. Però no té a veure ni amb la llibertat de Catalunya, ni amb el referèndum d'autodeterminació, ni amb la independència. És una altra història un altre eix . És un altre paràmetre. És un altre vector. Quina és la diferència entre el moviment sobiranista i el “si se puede”?. La gran diferència no és el que han de ser els objectius finals dels del punt de vista de la justícia social. I jo acostumo a situar aquest repte en la ment de les persones que ens escolten. Digue-me a una sola persona partidària de la sobirania de Catalunya, que al costat de la sobirania no hi posi com a tema principal la justícia social, el progrés, i la prosperitat del país. Ni una sola. Tota persona que defensi la sobirania de Catalunya la defensa per a unes finalitats i uns objectius molt concrets, que són aquests: la justícia, l'equitat, un país millor, un país més pròsper, un país mes creatiu. No hi ha divorci en aquest sentit. Les finalitats són aquestes. La sobirania no es teòrica, és una sobirania posada en servei de la millora de les condicions de vida de tota la població. Evidentment al servei de la gran idea de la justícia social, en un moment on la justícia social ha quedat esquerdada per la crisi econòmica. No treballo en un plantejament d’una dicotomia entre el que ha de ser la sobirania i el que ha de ser un país just des del punt de vista social. En canvi, el “si se puede”, trobareu l’anhel de la justícia social, evidentment. que sí, però no hi trobareu la discussió sobre els instruments i les eines i els estris per poder fer realitat aquesta justícia social. HI ha uns que ho abracen tot que son els sobiranistes i altres que es queden nomes amb una part i no parlen dels instruments ni les eines. Però sense instruments i sense idees quina serà la conseqüència? la conseqüència serà, que si voleu en diferents ideologies s'haurà de gestionar una autonomia retallada, disminuïda, amputada i ofegada. I amb una autonomia així no s'aconseguirà l’ ideal de la justícia social a Catalunya. Ni s'aconseguirà tot allò que Catalunya en aquest moment podria abordar des d'un punt de vista de projecte de país. Deixeu de parlar una mica d'això. A la conferència de fa sis mesos jo vaig deixar dit que quan haguem passat aquesta primera etapa, un dia tinc ganes d'abordar una mica el perquè de tot plegat. Ho dic d'una altra manera: què poden fer amb el nostre País si tinguéssim els instruments i les eines necessàries, per tant, l’autogovern necessari? que podríem arribar a fer? que es pot fer en el nostre país perquè realment sigui un país que des de tots els punt de vista valgui la pena?. 1- Es pot tenir a Catalunya com a ideal l'atur que tenen països com àustria o Dinamarca? Ens podem fixar aquest objectiu com a país? Es clar que sí. nosaltres podríem tenir la ocupació que tenen aquests països que són similars a nosaltres. No son grans potències econòmiques ni comercials, ni amb multinacionals, ni grans exèrcits ni grans poders, financers. Això sí tenen capacitat de decisió pròpia, tenen molt talent, nosaltres també.Tenen moltes energies, nosaltres també. Tenim i tenen molts actius. Elles tenen una capacitat de decisió, des de fa molt, temps que nosaltres no tenim. Aquesta és la gran diferència. Per tant, és evident que quan dibuixem el nostre ideal de país, podem pensar que sí que podem ser un país com Àustria o Dinamarca, des del punt de vista de la feina. 2- Podem Irene, tenir un país que tingui els mateixos resultats educatius de Finlàndia?. És clar que podem. Però no tenim les mateixes eines que Finlàndia per crear el nostre model educatiu. Cada vegada que intentem fer una passa endavant, ens trobem amb una LOGSE, una LOMCE, no sé quantes lleis que retallen sistemàticament l'aspiració que nosaltres puguem dirigir de manera autònoma i nostre model educatiu, i per tant el nervi central de la nació i el seu. Futur. Però podem aspirar als mateixos resultats que tenen països com Finlàndia. No tenim menys tradició pedagògica, tenim ben més segons com. I tenim qualitat des de molts punts de vista però tenim moltes limitacions. 4- Podem tenir unes infraestructures com els flamencs i els holandesos? És clar que es podria tenir. Perquè després de 37 o 38 anys de governs democràtics a Espanya tenim AVE per tot arreu, gairebé pertot arreu? En aquests llocs de pràcticament no hi anirà ningú, però costarà molts diners de mantenir i encara no ha arribat el moment de que la gran territori, o els grans territoris exportadors d'aquest país no tonguin el seu corredor ferroviari Mediterrani? Els flamencs sí que el tenen i els holandesos també i nosaltres no, pero el podrien tenir exactament igual que ells. 5- Podem tenir un sistema de salut que faci front al repte de viure més anys i de viure millor? En aquest sentit diria que no cal posa cap altre país com a mirall. Perquè el nostre sistema de salut, i aquesta setmana n'hem parlat al Parlament, el nostre sistema és tan bo o millor què dels altres. Però aquest sistema de salut nostre que està tremendament pressionat, pot complir el repte d’enfrontar-se a aquesta realitat social que estem tenint, i que es bona de viure més, i viure millor, i dóna garanties en aquest sentit? pensem en això. 6- Tenim país que pot arribar a garantir les pensions del futur amb un país en què hi ha persones que cada vegada mes grans i que viuen més anys? Això és més possible fer-ho amb un estat propi a Catalunya, o depenent de l'estat espanyol? Aquesta és una discussió que hi ha cada vegada que es parla de la possible independència de Catalunya. Evidentment, l’argument de Madrid sempre és el mateix. Si marxeu, us quedareu sense pensions. Però obliden una cosa que és molt important, que és que les pensions no les paga el pare estat com si fos una donació. Les paga si hi ha més gent que treballa o menys gent. I un país com el nostre, que pot aspirar a tenir l’atur d’Àustria o Dinamarca, que vol dir a tots de menys del 5 % és un país molt més viable econòmicament que l'estat espanyol per pagar les pensions de la seva gent això és així. Però ens hem d’acostumar que aquest sistema de pensions com el podrem assumir sent mes lliure so menys lliures? més productius o menys productius? Amb més atur o menys? Amb mes o menys Empreses? Aquest és el gran repte de país. 7- Poden tenir un sistema universitari d'innovació i recerca contra Israel?. Una altre moda fora de la Unió Europea però de població similar al nostre. Hem avançat molt en aquest terreny amb les eines que tenim. Però podem aspirar a situar-nos entre els millors també en aquest terreny. També en el camp de la Universitat, també en el camp de la innovació, també del camp de la recerca. Hem avançat molt però realment encara podem avançar molt més si tenim els instruments que ens calen. 8- Poden garantir un ús normalitzat de la nostra llengua i una protecció i promoció adequada de la nostra cultura? És clar que ho podríem fer. Però cada dia que ens llevem hem d'estar pendents de si hi ha una agressió nova a la nostra llengua. I això ho hem de patir en un país que té una clara idea de la importància de les llengües, i sobretot, que és un país bilingüe. Per tant, no és un país enemic de cap idioma, i molt menys del castellà. Però sent així com som i sent un país de naturalesa bilingüe, amb una llengua pròpia que és el català, cada dia hem de patir alarmes i agressions sobre la nostra llengua. Podem aleshores ser un país com Suècia, com Eslovènia, països també molt petits altres no tant, que no s'hagi de llevar cada dia amb el patiment de que tindrà un agressió sobre aquella la seva pròpia Llengua? Ells no s’aixequen cada dia pensant que la seva llengua serà agredida. L’han de defensar i promocionar i potenciar la seva cultura i la seva llengua amb la seva pròpia capacitat de governar-se ells mateixos i saben que ho poden fer. Nosaltres no. Aleshores, aquest és el país que poden fer. Tot això, tot això està al nostre abast. Tot això no son quimeres ni utopies tot això és possible Catalunya. Però és possible si no es sostrau el debat de quins són els instruments que tenim, i els recursos per poder fer un país d'aquestes característiques. Si el que pretenem és canviar l’eix a Catalunya i començar a parlar d'altres coses, i a veure com ens repartim l’autonomia retallada, amputada i ofegada, els resultats què en traiem, encara que alguns tinguin les millors intencions, seran resultats molt prims. Podem aspirar no a aquesta utopia, sinó que poden aspirar a aquest model de país que està a l'abast d'un país com Catalunya de la mateixa manera que està a l'abast de societats homòlogues com la que acabo de citar. Això és possible. L'únic que ho pot fer és que el sobiranisme. Un país així només el pot construir en aquest moment el sobiranisme. Evidentment, quan parlo de construir el país hi haurà molta més gent no sobiranista que també el construirà. Però la força motriu per construir aquest país és el sobiranisme i no una altra. Si volen canviar l’eix de tot plegat, aleshores ens equivocarem perquè no hi ha altra força alternativa a Catalunya que pugui construir un país d'aquestes característiques. No hi ha.. Per bones intencions que puguin alimentar qualsevol de les altres formacions polítiques que hi hagi en el nostre país. Si l’únic que ho pot fer és el sobiranisme, a més a més, deixeu-me dir, que ho pot fer tothom, per què ho vol fer per tothom. Estic convençut convençut que en la posició sobiranista del país sempre hi ha al cap a aquest país de conjunt dels ciutadans de Catalunya en aquest moment 7.500.000 de persones. Aquells que ens acusen de què ho separem tot, els voldria recordar que ningú com nosaltres té un país sencer al cap, i que són ells els que no s'han de preocupar gaire. Fins i tot els que decidim ser sobiranistes . Perquè quan nosaltres defensem la sobirania de Catalunya, nosaltres també pensem en ells i estem treballant per ells. Quan ells ens disminueixen l’autogovern, no sé si pensen en el conjunt del poble de Catalunya. Però quan els sobiranistes treballen per la sobirania de Catalunya treballarem pels sobiranistes i pels que no ho son, perquè també són ciutadans d'aquest país i ens adrecem a tots absolutament a tots. Això ho hem de començar a construir a les urnes. Aquest és el nostre gran repte. Això s'ha de començar a construir a les urnes. De fet, ja ho hem començat a construir així. Ho hem d'acabar de construir a les urnes. Ens hem poder comptar definitivament. Perquè aquesta és l'essència de la democràcia. Tenim un repte molt gran, que és saber si aquest país té una majoria o no a favor de la seva sobirania. Aquest dret el tenim, i com ho fem amagant-lo? Dient que el 9 no que existeix? Dient que uns quants bojos ens l’hem inventat? Dient què ens hem begut l'enteniment? Així no es resol convé un repte com aquest. ES resol posant les urnes i els col·legis i que la gent vagi a votar. És així i no d'una altra manera. És la manera civilitzada, i democràtica de resoldre els conflictes i les diferents maneres de pensar en democràcia. Ho deia aquesta setmana al parlament. Ningú s'escandalitza perquè algú sigui de centre Esquerra, o d'Esquerra o de dretes o de súperdreta o superesquerra radical. Ningú s'escandalitza per això. Resulta que a les taules del nostre país no és un gran conflicte que separa les famílies. Però si un té l'aspiració o l'ideal d'aquest Catalunya pugui ser un país com Àustria o Dinamarca, a llavores això separa i l'altre no. Au va ! això no s'ho empassa ningú..
Això, com qualsevol altra discrepància que hi ha en una societat madura es resol civilitzadament a les urnes. D'aquí el 27 de setembre. El 27 de setembre té aquest nord, aquest objectiu, i no un altre que és resoldre aquesta qüestió a les urnes. Això és del que pretenem que sigui un plebiscit. Fixeu-vos, i no és un tema, menor que uns i altres volen esborrar o desfigurar la caràcter plebiscitari d'aquestes eleccions. Digue-m'ho clar. Aquí hi ha coincidències curioses com a mínim. És exactament així. Quan sentiu parlar el partit Popular, el partit socialista, o Ciutadans,, quan sentiu parlar aquesta gent sentireu que “ això que vol fer mars són unes eleccions autonòmiques i res més”. Però jo els adverteixen d'una cosa. I adverteixo el poble de Catalunya. Si les eleccions del 27 de setembre, per al sobiranista no sortissin bé, seran els primer és a dir que ha sigut un plebiscit. Però com que els aterra és la possibilitat de que un dia a les urnes ens puguem comptar i que guanyi el sí sí. ara han de disminuir el caràcter d'aquestes eleccions. Però atenció, perquè després no el disminuiran si no guanyar sí sí. S'apuntaran a dir què ha sigut un plebiscit a tota regla. Mira però on, altres, volen fer un altre tipus de plebiscit, és aquest els deia. El de la pura dreta/esquerra, ho diem-ho d'una altra manera de la lluita de classes. I fixeu-vos fins a quin punt hi ha coincidència. La conclusió quina és? Que fent cas d'uns o dels altres el 27 de setembre no tindrà caràcter plebiscitari. I on ens porta això? A intentar canviar un Govern de Catalunya, a intentar alterar les majories parlamentàries que tenim ara, a poder fer pactes diferents del que pugui haver en aquest moment el Parlament de Catalunya, on ens porta tot això... ? I en qualsevol cas ens porta a haver d'administrar les coses amb l'autonomia retallada, i ofegada que us deia fa una estona, ens porta aquí. Si no aconseguim que aquestes eleccions tingui el caràcter que han de tenir, i que justificar la seva convocatòria. Que és aquest caràcter plebiscitari sobre el que va passar el dia 9 de Novembre. Aquells altres que volen fer un altre tipus plebiscit si que estan d’acord amb una cosa: que és que hem de fer fora a Mas. Això ho sentireu a un costat i a l'altre. Ho hem sentit aquesta setmana al Parlament i disculpeu la personalització. Hem de fer fora a aquest. Que no es aquest, és el que això representa en aquest moment. Hi ha qui decideixen uns i altres, sentireu més coses a un costat i a l'altre, tant des de Madrid com des de Catalunya, que arribaran aquesta mateixa conclusió. Que te a veure això, què té a veure treure simbòlicament a Mas amb el caràcter plebiscitari d'aquestes eleccions del 27 de Setembre? Res de res. Però els que ho plantegen així. No son poc poderosos. Intentaran què l’agenda sigui aquesta, i que aquestes eleccions del setembre no tinguin caràcter plebiscitari sobre la sobirania catalana..
Què vol dir això? Vol dir que en aquest cas hem d'intentar comptar-nos de la manera que es compta en aquest país per intentar resoldre les coses i construir el país que us deia. Comptar els si i els no. Jo se que dins del si hi ha ha matisos. I al no també. Però plebiscits no entenen de matisos. Perquè han de resoldre coses de rel, per tant, t'has de decantar en el si o en el no. Ja sé que el teu si no sigui exactament igual que el del teu veí. Però has de triar. Has d’assumir triar entre dos riscos. El risc de construir un país sobirà per Catalunya, per tant un estat, i el risc de no fer-ho. Perquè només es parla del risc de fer-ho, i què passa si no es fa? L'alternativa és aquesta. I aquesta ja sabem com funciona. En tenim molta experiència és de fa moltíssims anys. Per tant hi ha de riscos evidentment. El risc d'anar endavant des del punt de vista de sobirania, i el risc de no fer-ho. Què vol dir el risc de no fer res perquè a l'altre costat no hi ha cap altra oferta per Catalunya que no sigui la retallada, i de la seva autonomia i del seu autogovern. És el que estem vivint en aquest m moment només cal obrir els ulls per adonar-se de com estan exactament les coses. Aleshores, aquesta consulta aquestes eleccions, jo les vull convocar per guanyar-les. No nomes per convocar-les. Us llegiré el que vaig escriure el 25 de novembre de l'any passat en aquella conferència. Vaig escriure això “haver completat la feina per garantir al màxim la victòria del sí una consulta es convoca per intentar-la guanyar. Després es guanya o no això es el joc democràtic. Però l'intent s'ha de fer per guanyar”. Per tant jo la teva part del que volia compartir amb vosaltres és què poden fer en aquest moment per tornar a alimentar a fons el turbo de la il·lusió del procés sobiranista en el nostre país. Perquè si ho aconseguim, ens en sortim. I si no ho aconseguim vés a saber... No dic que no, però jo no ho sé. De la primera manera ens en sortim, de la segona no ho sé..
Aquesta força de la il·lusió, aquest turbo a la il·lusió, és com el vent, com el vent de popa és un vent tranquil, és com aquell vent de popa què t'ha de portar fins a Itaca. I si no hi ha aquest vent de popa et quedes en un port intermig o amarrat al port que estàs en aquell moment. Això ara és responsabilitat nostra. No la poden delegar. I quan dic que no la podem delegar no dic només de Convergència i el Govern de la Generalitat. El món sobiranista de Catalunya, ha de prendre consciència de fins a quin punt estem en un moment decisiu que no podem deixar perdre i, què es tracta de propulsar aquest vent de popa, aquest turbo de la il·lusió, amb el màxim de revolucions de forces possibles, per poder certament arribar fins a Itaca. És tracta d'això. I em direu, com es fa això? De propostes n'hem fet moltes d'aquestes temps i moltes d'elles no han acabat de tirar endavant. Si us passegeu a peu de carrer, que ho feu, que ens diu la gent? Com es torna a alimentar el turbo de la il·lusió col·lectiva per afrontar el plebiscit amb garanties d'èxit i de guanyar? De que parla la gent? ens diu màxima unitat. Ens diu d'això. Màxima unitat, aneu junts. Feu les coses junts. No us dividiu. feu pinya. Ens diuen això. Això diu la gent a dir. Quan parlo de unitat que consti ja ho dic d'entrada, perquè no hi hagi confusió, quan parlo de unitat no em refereixo a partits polítics. Això ja és va intentar, jo ho vaig intentar, vaig fer un plantejament en aquest sentit que no va ser acceptat. Per tant, deixem-ho de banda. En aquest sentit difícilment avançarem. Per tant el que diré ara no va adreçat a cap partit polític ni Esquerra, ni a la Cup. Va adreçat al conjunt de la nostra societat. Fixeu-vos la paradoxa que la qual es té. Tot el gran moviment que hi ha hagut en la política catalana dels darrers 3 i 4 anys ha vingut per gran mobilització del món sobiranista. I qui s'està agrupant de cara a les eleccions des de la política? El món del sí se puede. En canvi el món sobiranista no s'agrupa. És el món sobiranista el que ha canviat les regles del joc i el que ha fet moure el taulell i, en canvi el que s’agrupa es un altre per poder, legítimament poder quedar primer. En tenim alguns exemples a Catalunya després de les eleccions municipals. En canvi, el món sobiranista no ha trobat encara la manera de contrarestar aquesta situació i posar l’eix de manera molt clara en aquest sentit plebiscitari del sí sí d’aquestes eleccions del dia 27 de setembre. La gran pregunta que al mateix temps és una invitació és, com que hem de deixar de banda el moviment dels partits polítics en aquest sentit que ara us deia, es pot fer realitat aquesta unitat que necessita Catalunya i el sobiranisme com el pa que menja a través de la seva societat civil organitzada, sí o no? és pot fer o no es pot fer? Aquí hi ha un paper a jugar. HI ha un paper determinat,, decisiu i un paper central. Tenim tota una sèrie de gent organitzada, d’entitats organitzades que han mobilitzar centenars de milers de persones. Que han fet la seva feina, que han ajudat a treure la gent al carrer, que s'han comportat amb un esperit patriòtic molt important. Que no estaven a la política. Sinó a le entitats del país i que es creuen que Catalunya pot ser aquell país que jo descrivia abans. I que saben que ara que estem a les hores decisives. I que en aquest moment no podem fallar. Em refereixo l’ assemblea Nacional Catalana, a Òmnium , a l’AMI , a un munt d'entitats que estan al Pacte Nacional per dret a decidir, totes aquestes entitats que representen gent al nostre país tenen aquesta fase decisiva, ultima, un paper important a jugar des d'aquest punt de vista de la màxima unitat possible del món sobiranista. Deixo de banda els partits perquè no hagi interpretacions. Em dirigeixo directament a aquestes entitats.. És possible que treballin en aquests propers dies i setmanes per aconseguir la màxima unitat possible i, per tant la màxima força possible, i per tant les màximes garanties possibles perquè guanyem el 27 de setembre? És capaç que amb la seva energia i empenta, i el seu lideratge iom capaços de posar a l'agenda del país aquest concepte de la màxima unitat possible? Doncs bé, jo les convido a fer-ho. Jo convido a aquestes entitats sobiranistes que en aquest aquesta hora decisiva de Catalunya, on ens ho juguem tot, per la victòria del sí sí, es posin a treballar seriosament perquè aconseguim el màxim d'unitat possible. En aquest moment és urgent i imprescindible, gairebé imprescindible. Aquesta crida a agrupeu les forces sobiranistes. No parlo de les polítiques però europeu la forces sobiranistes. És parlar de la llista del president.. Ja he dit que aquest és un concepte que a mi m'incomoda concepte. A mi m'incomoda. No deixa de ser una personalització que jo crec que en aquest moment no és la que convé. Aleshores quan jo dic en aquestes entitats sobiranistes , quan els dic podeu vosaltres agrupar forces? Podeu sumar forces en aquest camp sobiranista? Podeu garantir que hi hagi el màxim d'unitat possible? Jo també dic no peneu en la llista del president, penseu si cal en una llista amb el president, que no és el mateix,. No és el mateix la llista del president que la llista amb el president. Si jo faig una crida en aquest moment decisiu agrupar forces del mon sobiransita, més enllà dels partits. Deixem els partits de banda. Si faig aquesta crida a les entitats, al món sobiranista, jo no puc pretendre fer aquesta crida i dir veniu a la llista del president. Ara, jo puc fer una crida perquè es compti amb mi, en la mesura que calgui i fent el paper que toqui. I m'atreveixo a dir una altra cosa. Crec que és pot comptar amb Convergència Democràtica de Catalunya per fer aquest paper de gran servei al país en aquest moment Crec que s’hi pot comptar. Això evidentment no ho puc decidir jo sol però crec que s'hi pot comptar. N'hem parlat moltes vegades aquests darrers temps del paper que pot fer CDC al servei de Catalunya en aquest moment. I més enllà de Convergència, és pot comptar per exemple, ho hem vist aquests dies es pot comptar que hi hagi gent de la democràcia cristiana catalanista i de si si d'aquest, país que es pugui sumar a una iniciativa així. És clar que sí. I els necessitem. Igual que necessitem a tota aquella gent del món socialista catalanista que també estan al si si. I també els necessitem. Aquella gent que ve dels mon de l’antic PSUC o del comunisme. O qualsevol aquests corrents que ha sigut profundament catalanistes i que han arribat a la conclusió, que o anem pel camí de la sobirania o no ens en sortirem. Però és evident que si això ho fem des d'un partit, doncs no ens en sortirem. I si ho fem des d'una persona tampoc ens en sortirem. Però si això en aquests propers dies o setmanes ho assumeixen aquestes entitats altament mobilitzadores de la societat, assumint això sí una responsabilitat que potser no els pertoca a ells com a associacions, però què poden fer, és també un bon servei al país si s'ho plantegen així. Per què no?.. Dit d'una altra manera, fem la unitat des de la societat. Fem la unitat des de la societat i posem-nos els partits, tots ells, tots els que vulguin...ningú te obligació de fer-ho. Tothom pot entrar, tothom pot quedar al marge. Jo he parlat de mi , de CDC i parlo d’altres entitats que crec que s’hi podrien agrupar per fer la unida possible des de la societat civil. Fem la unitat necessària. Encarem el 27S amb mes garanties d’èxit. No deixem que nomes s’agrupin els altres. Perquè m’atreveixo a fer el plantejament que he fet a avui? M'atreveixo per les tres o quatre coses que es diré com a punt final. M'atreveixo a fer-ho perquè el setembre de 2012, se'm va demanar 1.500.000 de persones al carrer, se'm va demanar de fixar un objectiu per a aquest país que és dia un Nou estat d'Europa. Quan nosaltres havíem guanyat àmpliament unes eleccions, amb el projecte del pacte fiscal des del punt de vista d’eines nacionals i davant de la rotunda negativa de l'estat espanyol, ni tan sols a seure a la taula per parlar del pacte fiscal, davant d'aquella negativa i d'aquell clam popular que hi havia al carrer, jo vaig posar les urnes el 25 de novembre del 2012 en l'esquema del dret a decidir, que era ell primer pas per comptar-nos des del punt de vista de si en aquest país hi havia majoria suficientment àmplia per treballar a fons per una consulta definitiva per la llibertat de Catalunya. Vaig fer això. Vàrem ferm això. Vàrem posar les urnes el dia 25 de novembre de l'any 2012. Alguns diuen que les van posar i que vam perdre diputats. I tenen raó. I jo els contesto que si les poses i perds diputats i continues endavant deu tenir algun valor. Perquè jo era aquell moment tenia una excusa molt bona, he posat les urnes, no he tingut l’aval que segurament nosaltres esperàvem a les urnes, sabeu què? Tirem per un altre via ... Fem una altra cosa que sigui més còmode no porti tants problemes ni tantes ... fins i tot querelles per la via penal. Per exemple.. Però vam continuar. Aleshores es va demanar una altra cosa. Se'ns va dir, ara acordeu una pregunta i una data perquè els catalans i les catalanes puguem dir si Catalunya ha de ser o no un estat independent i tota la controvèrsiain expectativa del moment va ser si el concepte estat independent havia de sortir I ningú donava un euro perquè sortís el concepte d'estat independent. I se'ns demanava això. Iés va acordar una pregunta i una data amb el concepte estat independent i que la gent pogués votar pel sí sí. I 1.900.000 persones que van votar aquesta tria. Després és va dir una altra cosa, es va dir ara a més a més d'haver acordat la pregunta, ara poseu les urnes. Se'ns va dir això. I Déu n'hi do. Això de posar les urnes perquè no vam rebre carícies precisament. I algunes vegades vam tenir grans controvèrsies ha des de Catalunya sobre què significava posar a les urnes. Jo sempre vaig entendre una cosa, que devia ser bastant fàcil d'entendre per al comú de la gent. Que posar les urnes era posar-les i no una altra cosa. Era obrir els col·legis. Posar les urnes i que hi haguessin les paperetes del sí sí. Això és el que vam entendre. I crec que això és el que volia la gent. I per això aquella gran mobilització el dia nou de novembre. Exemplar, pacífica, cívica, de bon rotllo pensant en el país. Allà no hi havia la gent que portava l'etiqueta jo sóc de dretes i els d'esquerres, no hi havia aquesta gent. Hi havia la gent que volia la llibertat de Catalunya. Hi havia aquesta gent. Hi havia aquesta gent no els altres. Vam fer exactament això. I després d'això del 9 de novembre què més es va demanar? se'ns va dir, ara com el nou de novembre ens han posat a prova i no elens hem pogut comptar tots, i nomes hana nat a votar els del si si... i alguns del no... se’ns va dir ara, a més a més utilitzem l’últim recurs que tenim a les mans. Agafem les eleccions i convertir-les en la consulta. I quina va ser la nostra resposta? Els acords per fer les eleccions el 27 de Setembre. Què vull dir amb això? Que des del setembre de 2012 fins ara mateix, cada moment què al Govern i a mi mateix se'ns ha demanat que féssim un pas endavant encara que fos complicat, difícil, costerut, nosaltres no hem mirat cap a un altre costat. Hem mirat de cara a la realitat, hem escoltat la gent i hem actuat en conseqüència i ens la hem jugada. I precisament perquè hem actuat, així avui m'atreveixo, i dic m'atreveixo, a demanar a uns altres què en aquest moment decisiu, alguns altres que també han treballat tant com nosaltres o més, que en aquest moment tan històric agafin la seva quota de responsabilitat i de lideratge i aconsegueixin la màxima unitat possible en el món sobiranista de català. Jo demano això. Vull fer notar una darrera cosa. En aquest jugar-se-la i també en contra de molts pronòstics, hem portat al límit del sí sí i de la nostra convicció en aquest sentit, fins al punt després de 37, anys a la separació d'una fórmula electoral i d'una fórmula política que és Convergència, o era Convergència i Unió que havia tingut èxits importants en aquest país. Hem portat les coses fins a aquest límit. Per tant, ens l’hem jugada al 100%. i jo crec poder dir que hem sigut coherents amb el que defensaven en plenitud. Fins a les últimes conseqüències. Ara que ja estem gairebé al final, jo m'atreveixo a demanar això. Màxima unitat, no dels partits, ja sé que aquí no cal plantejar-ho. Respecto els acords que tenim en aquest moment. Per tant no hi ha cap tema en aquests sentit. Però sí una apel·lació directa a aquestes entitats sobiranistes, aquesta societat civil perquè acceptin de parlar-ne i perquè acceptin de parlar-ne estant nosaltres a la seva disposició. També he de dir que pot ser que això en puguem, parlar i què al final per la raó que sigui no acabi de sortir. Si no acabés de sortir, seguirem assumint les nostres responsabilitats. Que ningú ho dubti. Per tant, el que estic plantejant avui de cap manera s’ha d’interpretar, el part de ningú, com que hi ha algú que no s'atreveix, .... En qualsevol cas nosaltres assumirem la nostra responsabilitat. Però una cosa és assumir la seva responsabilitat, i crec que l'hem assumit des del primer moment, i una altra és renunciar a fer allò que tens la plena convicció què li cal al teu país en el moment més decisiu que ha viscut en els darrers tres segles. Jo no hi puc renunciar ni crec que hi podem renunciar a tots plegats. Per tant, aquest intent val la pena fer-lo i nosaltres ens posem, col·lectivament, i jo també personalment, a disposició de construir la màxima unitat possible en conjunció amb la societat civil sobiranista organitzada d'aquest país. Construir un estat amigues i amics requereix tenir sentit d'estat. I lluitar per la llibertat d'un poble requereix alliberar-se de les agendes personals i de les agendes corporatives. No es pot aspirar a construir un estat sense sentit d'estat. No es pot aspirar a construir i aconseguir la llibertat d'un país i la llibertat de Catalunya si les agendes personals o corporatives, per legítimes que siguin, passen per davant d'aquelles que en aquests moments són la suma necessària de tots.